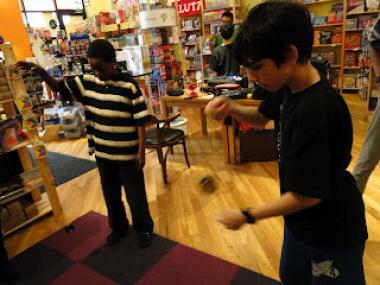 Children play with yo-yos at Cat & Mouse Game Store, Fall 2011 in Bucktown. BUCKTOWN — After more than eight years, Cat & Mouse Game Store will close its Bucktown location next week to focus on its newer West Loop shop. "We have to admit that we're a little bit sad and a little bit excited," owner Linda Schmidt told fans in an e-newsletter. "Sad, because Bucktown is wonderful and close to our home, and we have truly loved getting to know many fantastic people in the neighborhood. Excited, because we're looking forward to some much needed change." Located at 2212 W. Armitage Ave. in Bucktown, Cat & Mouse Game Store opened in 2009. The family-owned retailer — which specializes in board games and classic toys like yo-yos, as well as weekly meet-ups for gamers — added a second spot at 1112 W. Madison St. in the West Loop in 2012. Schmidt said the Bucktown store will close Tuesday night after its weekly game night, and then reopen from June 2-4 for a "We don't feel like moving this!!" inventory reduction sale. Schmidt, a Humboldt Park resident and mom of two, said "running two stores is a lot more work than running one store." "We're at a point where we're trying to simplify our lives a bit, while at the same time our West Loop store is busier than ever. Going back to one shop just makes sense for us personally," Schmidt said. For updates and more info in the consolidation, including new expanded hours at the West Loop store and weekly events, visit the Cat & Mouse website.